The mountain top debate unfolded last week at the University of Charleston, West Virginia. A selected few, of 950 environmentalists, residents and politicians, including the famous Alec Baldwin all gathered to hear the point of view of two important individuals. 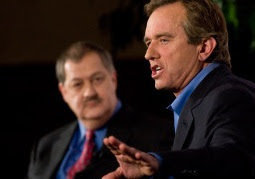 It was environmental attorney, Bobby Kennedy, Jr. versus CEO of Massey coal, Don Blakenship. While you can imagine the coal topic was heated on multiple fronts, the structured debate focusing on production and consumption had the local and online media on the edge of their seats. From putting food on the table and paying mortgages to destroying creek beds and polluting the water supply...everyone was glued in for 90-minutes. To see more updates, read here.